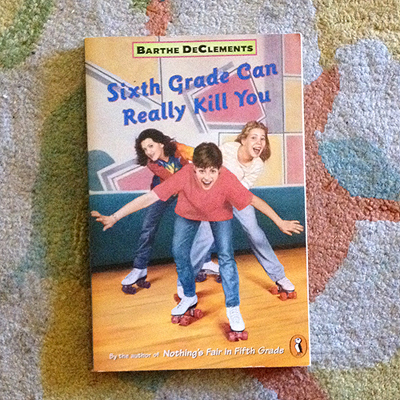 I read this book when I was a kid, even before I was in sixth grade. I loved reading books about school way more than I loved attending school. I liked thinking about what school could be like, instead of what it was actually like for me. I remember reading Sixth Grade Can Really Kill You when I was in lower elementary school thinking my sixth grade year would be as fun as this. I re-read the book last month and still really enjoyed it. There was probably a fair amount of nostalgia: remembering myself reading the book and the hopes it gave me for my sixth grade year. The book is a bit dated; it was originally published in 1985, and there are references to guys wearing half-shirts… yeah. But it’s a fun, quick read for kids, and it’s an entertaining story. The book was banned in some school libraries because it uses the word “retarded”. I don’t agree with that word being used in any way, whether to describe someone with disabilities, or as slang to refer to something “crazy”, but I don’t think it means a book should be banned. The way the word is used in Sixth Grade Can Really Kill You is to describe Helen, who has a learning disability, but it’s not portrayed as being the correct way to refer to someone as a disability, so I think kids could read it and know it’s not a word they should use, but it’s a word that is used. It could be a talking point with kids to let them know why some terms are hurtful, even if they’re not being used for that purpose.